Recipients of National Science Foundation Graduate Research Fellowships are seen by the federal agency as potential leaders in research, teaching and innovation in engineering and science. Career success for these students is viewed as critical to the United States maintaining its leading role in technological advancement and its strength in national security. The NSF also counts on the students’ future contributions to boost the vitality of the country’s economy. The Graduate Research Fellows are awarded a three-year annual stipend of $34,000 and a $12,000 cost-of-education allowance for tuition and fees to pursue graduate degrees. They also have opportunities for internships, professional development and participation in international research projects, and the freedom to do their own research at any accredited U.S. institution of graduate education of their choice. Three graduate students in Arizona State University’s Ira A. Fulton Schools of Engineering — each pursuing a doctoral degree — are among the 2016 recipients of the highly sought after NSF Fellowships. Alyssa Henning earned a bachelor’s degree in biological engineering with a minor in biomedical engineering from Cornell University and a master’s degree in agricultural and biological engineering from Penn State University. She chose to come to ASU to pursue a doctoral degree in biological design in the Fulton Schools in large part because of the opportunity to work with faculty members whose expertise is in the emerging field of synthetic biology. At Cornell she got involved in the top collegiate synthetic biology challenge — the International Genetically Engineered Machine Competition, known as iGEM — which led her to meet synthetic biologist and Fulton Schools Assistant Professor Karmella Haynes. She also saw evidence of the university making investments in building high-quality lab facilities. “All of that was very appealing,” she says. “And they give you a chance to come up with really cool, imaginative research projects,” rather than stick to a traditional track. Henning is now doing the first of three rotations for her doctoral studies research in Haynes’ lab. Along with the technological and engineering aspects of synthetic biology, Henning is also interested in exploring the ethical and policy issues involved in the field. She will be looking into science policy and practice in her second research rotation, under guidance from Emma Frow, an assistant professor in the Fulton Schools biomedical engineering program and the School for the Future of Innovation in Society. She’s considering challenging herself to do a doctoral dissertation that will combine a focus on technical aspects of synthetic biology along with an examination of policy and practices in the field. Henning says she may also get involved in mentoring ASU iGEM teams and pursue opportunities to teach as she works toward her degree. She has her eye on various career paths. “I hear the FBI is looking for synthetic biologists, or maybe I’ll look for work with a cultural institution like the Smithsonian Institute,” says Henning, who grew up in Bakersfield, California. Outside of academics and research, she hopes to contribute to the local cultural scene by continuing to promote taiko drumming. “Taiko” is the Japanese word for “drum.” The use of large drums originated in Japan centuries ago as a form entertainment or celebration at various festivals that continue to this day. The custom has since expanded into an ensemble performance art involving many drummers and many types of drums. Henning first joined the Genki Spark taiko group while doing a one-year internship in Boston after graduating from Cornell, and then started the Penn State Taiko group while earning her master’s degree there — and even successfully lobbied for some funding for the troupe from the university. Only a few months after arriving at ASU, she co-founded Sun Devil Taiko with Barrett, the Honors College students Tanyon Berry and Bradley Kemp. 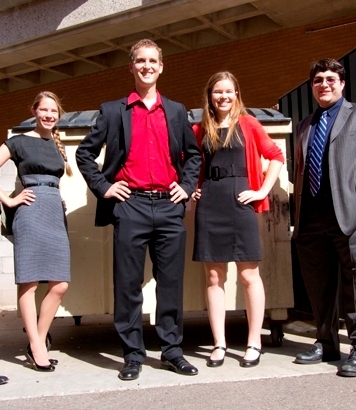 Their ensemble debuted this fall semester at a Barrett Showcase event as part of the college’s recent Family Weekend and performed as part of the entertainment at ASU’s Homecoming Parade and Block Party. One thing has led to another for Samantha Janko. As early as her elementary school years, she discovered an affinity for science and math. The kinds of things she was interested in making drove her choice to focus on robotics and alternative energy technologies while earning a bachelor’s of science degree in engineering ASU. She received the degree in 2015 as one of the Fulton Schools’ honored Outstanding Graduates and continued working toward a master’s degree in engineering. 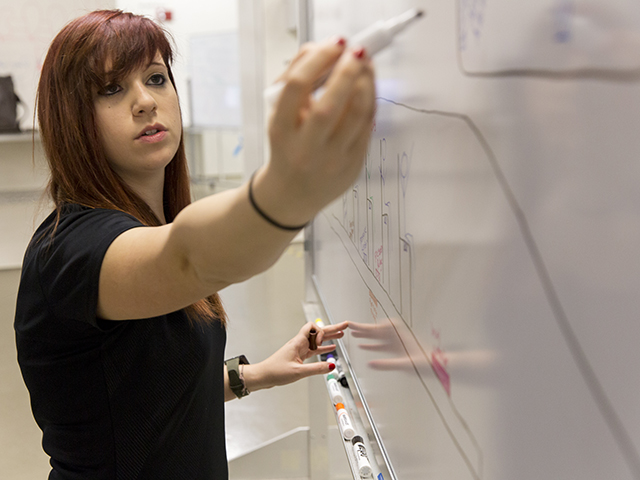 The plan to get a master’s degree was elevated into a pursuit of a doctoral degree in systems engineering when she was awarded the NSF Graduate Research Fellowship. Her work now centers around the Laboratory for Energy and Power Solutions (LEAPS) directed by her doctoral studies advisor, Assistant Professor Nathan Johnson. Janko says her studies in robotics and energy technology led to a desire to delve into the “big picture” of what it takes to move those technologies out of the lab and into their full potential for productive use in society. That’s where systems engineering in particular enters the picture. 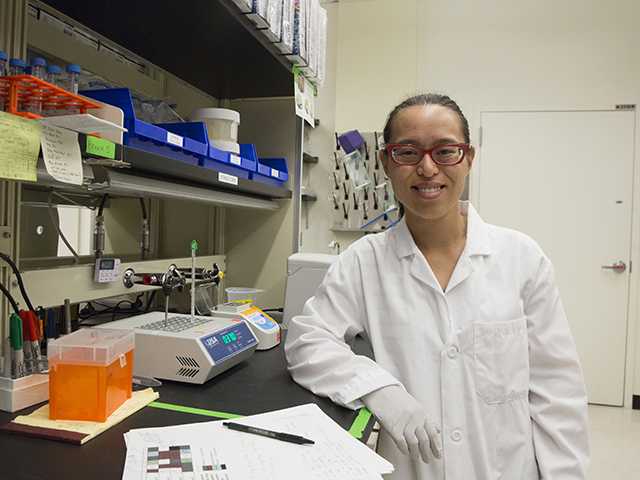 Her graduate research in the LEAPS lab provides the opportunity to do just that. “We do work with industry partners. So I have gained experience on the business and economic side of things,” she says. 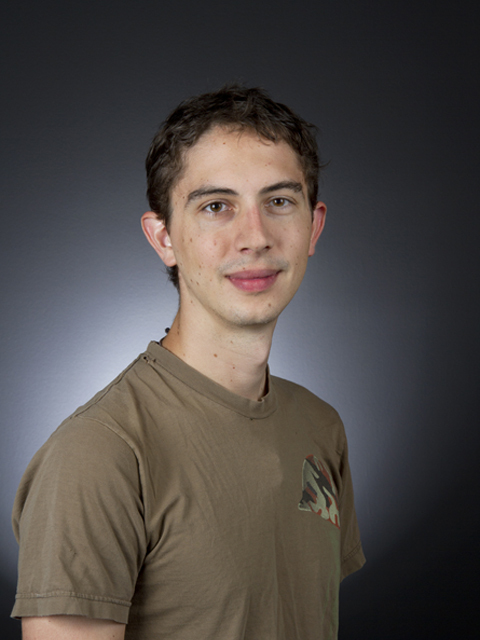 Janko is on a team that is seeking to make advancements in microgrid systems. They’re small power grid systems that can “live on their own,” without being connected to a main power grid system, she explains. Because they can operate independently, microgrids are considered important to bolstering the resiliency, efficiency and security of the nation’s power infrastructure. Working to improve microgrid systems fits with Janko’s interests because of the potential for their use to pave the way for integrating renewable and alternative energy sources, such as solar energy and wind power, into major power grid systems. What also appeals to her is the mix of analytical and physical tasks necessitated by research and development in this area. The results of her lab work have so far contributed to development of a containerized microgrid system to provide for rapidly deployable power during disaster relief efforts, and a universal charge controller designed to help supply power to more than 50 million people. 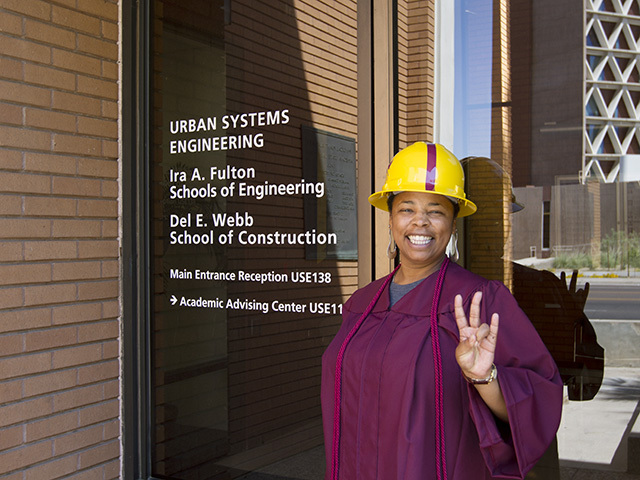 Janko chose to stay at ASU for her doctoral studies not only because of the faculty’s expertise in energy engineering and robotics but also because of the working environment in the research labs. She is also involved with AZLoop, a team of students at ASU and other Arizona universities that has entered the Hyperloop Pod Competition organized by SpaceX, a technology company founded by well-known entrepreneur Elon Musk. The competition challenges teams to design and build passenger pods for the high-speed ground transport system SpaceX is developing. Janko is leading the power subteam that is responsible for the design and development of the AZLoop pod power system. The task includes power system sizing, modeling, component selection, electrical infrastructure and safety circuits, power and battery management system controls, and integration of subsystems. During her time at ASU, Janko has been a tutor to fellow students, and she hopes to do some teaching while she works toward her doctorate. She also wants to find some time to maintain other interests outside of studies and research. “I play piano. Nothing real great, but it’s something I can do to get my mind off of other things for a while when I need to do that,” she says. For now, though, a busy life mandates a simple routine. “I eat. I sleep. I go to school,” she says. Anjali Mulchandani graduated from the University of California, Los Angeles, in 2014 with an undergraduate degree in civil and environmental engineering. But one of things that most strongly drew her interest there was a presentation by a visiting ASU engineer. The talk by Fulton Schools Professor Bruce Rittman, director of the Swette Center for Environmental Biotechnology, put ASU on her list of places to explore when she was ready to apply to graduate school. On her visit she met other ASU engineering professors whose expertise aligned with her interests in water-related engineering. Now Fulton Schools Vice Dean of Research and Innovation, Professor Paul Westerhoff, a leading water treatment researcher, is her doctoral studies advisor. Her research and studies to earn a doctoral degree in the field focus on developing ways to reduce the amount of waste generated and the amount of energy consumed by current and emerging water treatment systems. She is getting to pursue that goal by working with the ASU team led by Westerhoff that is part of a National Science Foundation Engineering Research Center, the Nanotechnology Enabled Water Treatment Systems center, or NEWT. She was the president of NEWT’s Student Leadership Council, heading a group of students from each of the four universities that are part of NEWT. They helped to set the direction of the center’s research agenda and to communicate to the public about the center’s work. Those students are also forming a network to continue collaborations on research as they complete work toward their degrees and embark on their careers. Along with research, Mulchandani is putting significant time into gaining more experience in teaching, which she also wants to be a major part of her career. The K-12 education outreach she’s done so far has led her to “fall in love with teaching, especially with teaching young students, because they are so open to learning and get so excited about it,” she says. Mulchandani has worked on a National Science Foundation-supported project with Fulton Schools Assistant Dean of Engineering Education, Associate Professor Tirupalavanam Ganesh, that teaches sixth-grade students about water-related science. She is currently teaching an after-school program in local elementary schools for which she devised the curriculum and the experiments that her young students conduct to learn basic principles of science and engineering. 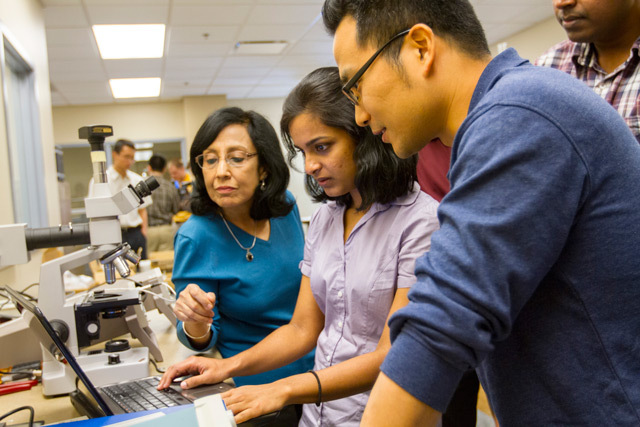 She has also recruited her fellow graduate students to participate in ASU’s annual Night of the Open Door event that showcases the university’s research endeavors. 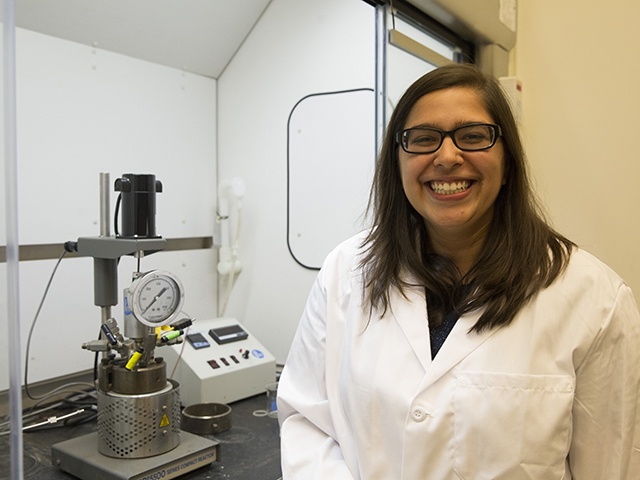 Some of the lessons she teaches young students in her education outreach classes are drawn from the research Mulchandani highlighted in the proposal that earned her the NSF Graduate Research Fellowship: her work on methods to recover gold, other valuable metals and bio-oil from sewage sludge. With her presentation titled “You flushed the toilet, now what?” she teaches students about wastewater treatment plants, metals that are in foods and personal care products that end up in sewage, how sewage and waste are currently disposed of, and new sewage treatment and resource recovery technologies. Work in those areas not only provided her a topic for her master’s thesis but won her research presentation competitions and awards at a national Sustainable Nanotechnology Conference, at an AZ Water Association Research Workshop, and at a research symposium for ASU graduate students in civil, environmental and sustainable engineering. She also won the AZ Water Association’s Young Professionals Fresh Ideas competition for a presentation at the AZ Water Association annual conference earlier this year. The association then sent her to the American Water Works Association Annual Conference and Exposition this past summer in Chicago, where she presented her work to a national audience of water science and engineering experts. Getting support from an NSF Graduate Research Fellowship award to help her pursue career goals in both research and teaching is a big motivator.